On a weekly basis we have trainings on the finer points of “The Hirsh Process,” and today I’m giving you a sneak peek into our behind-the-scenes. Since I started my company, and especially since working with bigger name clients, my team primarily focuses on connection-based marketing and retargeting ads. #1. We use Facebook ads to increase visibility and warm-up the audience with multiple touchpoints, before we ask them to purchase. #2. We retarget Facebook ads to people who’ve already made contact with the brand in some way (on social media, on the website, with the opt-in, etc.). A lot of online business owners focus only on the first touchpoint. The beauty of Facebook ads is that we have so many other opportunities to connect with our people. 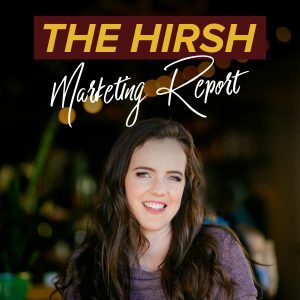 The Hirsh Process uses engagement and connection-based marketing to ensure that when clients open up their for-sale programs, people come flooding in. People will know and trust your brand already, so they’re more likely to buy. Let’s say you’re planning a 7 day launch. That doesn’t mean you put sales ads up for seven days and hope they convert. You have specific ads for maybe the first 48 hours, then maybe testimonial ads for the next 72 hours, and then your final ad for the last 48 hours. If you put up a few simple versions of the same ads, it might be seen many times by many people, but it’s also ineffective. Plus you’re missing out on a massive opportunity for retargeting. You don’t have to just hope for the best. You have a lot of control with Facebook ads. And that’s my core process with clients. When a client joins our roster, they receive a call with me. During that call, I pull out the connection points that we can make with their audience through cold-traffic marketing, warm-traffic marketing, and hot-traffic marketing. I have to pull this information from my clients. But when I have it, my Team can strategize specific campaigns, depending on the end goal that will meet people at all different levels. This isn’t something you can do with another platform. This is truly the beauty of Facebook ads, to retarget ads and ad spending to people who have already connected with you. And that’s basically The Hirsh Process. The best part is that right now we’re getting 10X ROI for our clients by using this process, including connection-based marketing that leverages retargeting and hitting people with multiple touch points along the way. More and more we’re seeing sales come in the webinar replay, the follow-up email, and the retargeted Facebook ads. That’s why retargeting is vital right now. That’s where the goldmine lies. And if you’re not leveraging that, you’re leaving money on the table. P.S. This was a behind-the-scenes look at how we work at Hirsh Marketing. But what if you could get even more behind-the-scenes from, not just me and my team, but other leading experts? For FREE? 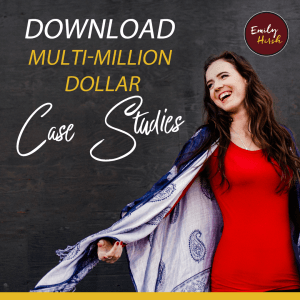 With 30 other industry leaders, I’m joining Lina Escamilla inside her Business Accelerator Series, and we’re sharing our secrets to hitting 6- and 7-figures, plus the systems + structures that can 5X your biz growth! Sign up here!